Been under the weather today, but still tossing around some ideas for WormGate or as Needles has been calling it "High Tech Mysticism & High Caliber Adventure". Swords & Stitchery continues to be churning out great ideas! 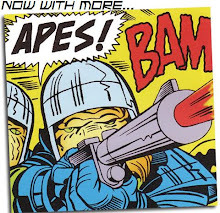 I love his latest post featuring MODOK also some great ideas using.A.I.M. In using my Google Fu I came across some great Sci Fi artwork by Theo Stylianides you can find his gallery here. Here are some of my favorites from his site. He calls these Helldivers! Needles recent post about A.I.M. 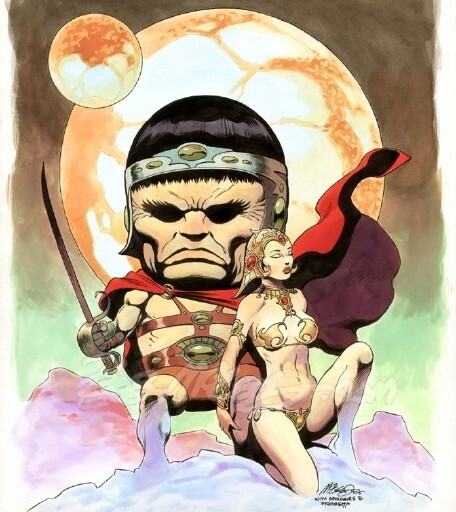 reminded me of a cool picture of MODOK that I found awhile back. Here is MODOK like you've never seen him before! WormGate Runners! Was Something with Gunz part 2 or is it 3? 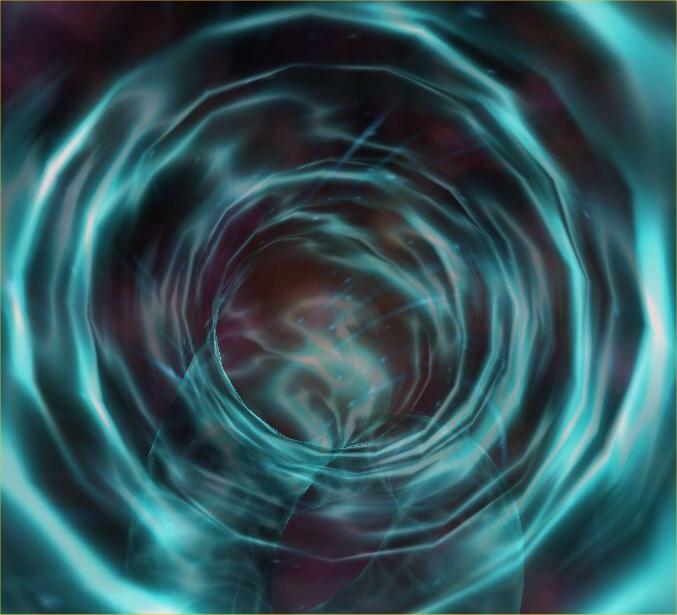 Anyways tossing around some ideas I was thinking about referring to the Wormholes/portals that the groups use as Wormgates? hence the title WormGate Runners...still considering ideas. I've abandoned the idea of using the X-plorers RPG for this, I want something a bit more D&Dish. Still working on things but at this point I'm gonna use psionics, random alien tech and random robot generation from Carcosa, Terminal Space for the well "Space" stuff, Lovecraftian beasties from both sources, ya never know just what the Hell is on the other side of that Wormgate! Loot mutations and stuff from Mutant Future as needed (you come upon a foul smelling herd of Xeno Cattle! yuck!). Still narrowing down the specific OSR system to tie it all together, I haven't decided yet but its getting close. 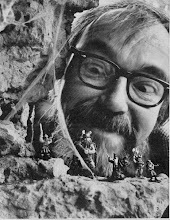 I will be using a couple of NON-OSR Products though...*GASP*...a shudder ripples through the blogosphere. A couple of 3.0 products actually!...One by none other than Monty Cook himself! 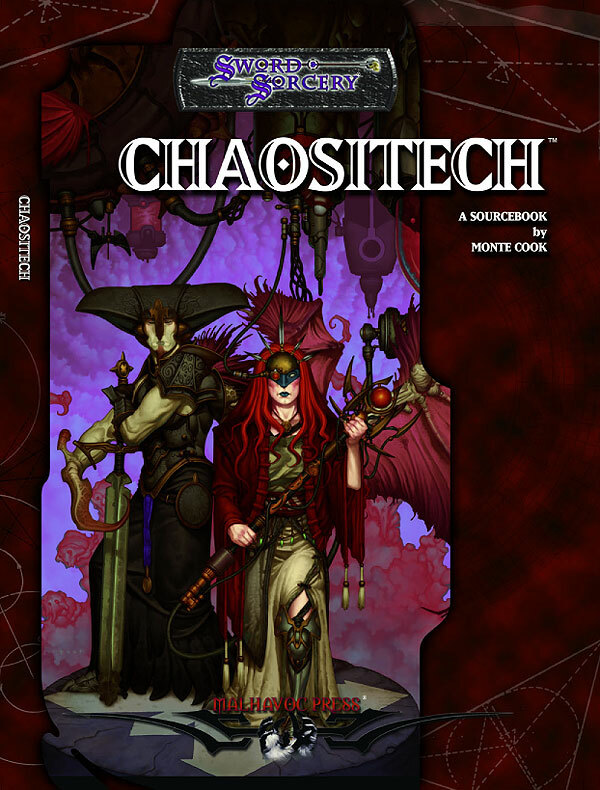 This unique sourcebook from 3rd Edition codesigner Monte Cook introduces chaos-powered items that resemble both technology and magic, but are truly neither. Within these pages, discover the secrets of devices like the cohesion blaster, the darkness imbiber, and chaosomatons. 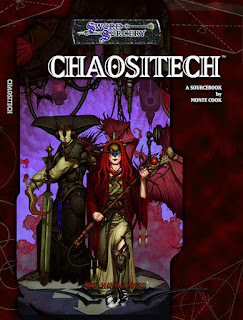 Chaositech also contains rules for chaos magic, including dozens of new spells, plus lots of original feats and prestige classes. Topping it off are chaos cults, mutation rules, plus the Galchutt, the fused aberration, and other all-new chaotic monsters." Hope I don't lose my Grognard cred by using this one, No I won't be using Feats, AoO, or Prestige Classes, but there is still alot of stuff to loot and pillage, I'll just toss out the icky 3.x stuff that I don't need. And finally (for this post at least) I'll be using a great gaming product from my 3.0 Dragonstar gaming days that I never got to use... 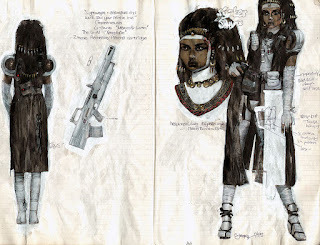 I want guns in this campaign but I want unusual and interesting guns I want Techno-Magic Guns! I'm gonna use Arsenal! · Over 200 magical firearms, from the arcane blaster pistol to the divine vindicator autocannon, modifiable by 11 special abilities and 10 accessories. · 8 different types of advanced magical armor. 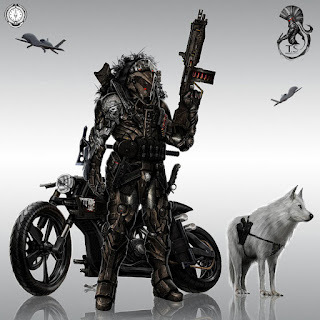 · 36 special abilities for armor. 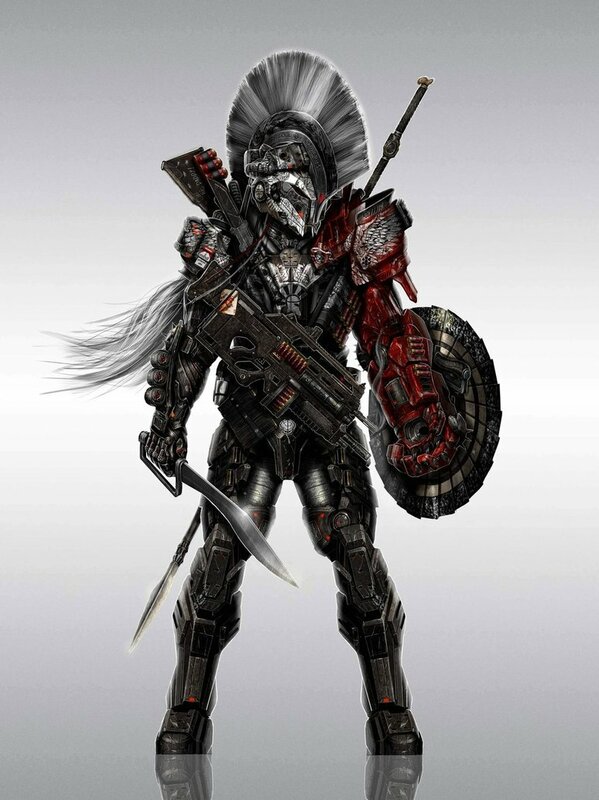 · 12 specific suits of armor, from Blisskin designer gowns to the divine Paragon Battle Suit. 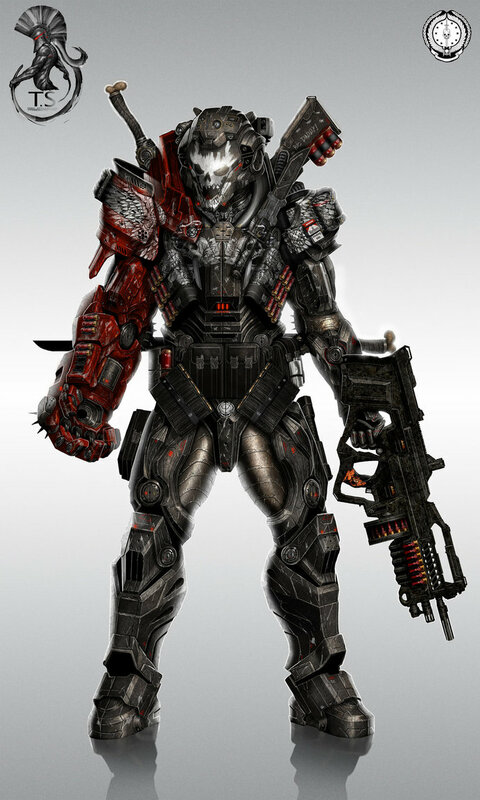 · Over 100 different types of grenades, explosives, launchers, missiles and rockets. · Combat rules options, additions, and suggestions for maximizing your lethality with the new equipment." This godgun focuses holy power into a ray of solar brilliance, emitting a blast of light that sears like the hottest fire accompanied by a loud sizzling sound. The calefactor is the only divine weapon that is commonly found without signature technology restricting the user. Gods opposed to the undead graciously permit anyone to use their weaponry to destroy such beings. Calefactors focus the purifying light of the sun and inflict greater damage against undead. Anyways that's all for now. Thanks for reading my crazy rant! -B. World Wildlife Federation of Justice! Here's a fun one I stumbled across the other day. Artist Toren Atkinson is working on a fun looking Anthropomorphic Supers RPG called World Wildlife Federation of Justice! 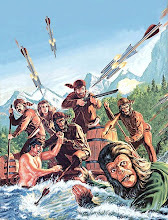 It will be for the Mutants and Masterminds RPG. I haven't played the new edition of that game, but man this looks like alot of fun! Art is copyright Toren Atkinson, no infringement is intended. Wisdom from the Wastelands Issue 4 Released! 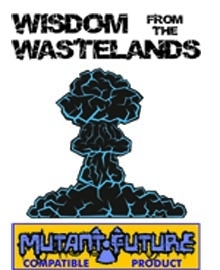 Wisdom from the Wastelands Issue #4 is Now Available! 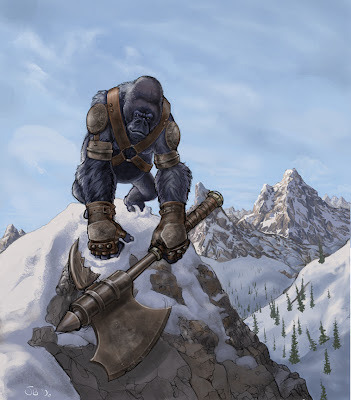 "This issue of Wisdom from the Wastelands contains seven new “races” for players and GMs to use in their campaigns. Rules for dealing with robots are also included." I just downloaded this one. Haven't had time to read it yet, but I'm definately seeking some stuff in it I can use in my Mutant Future Campaigns! Heck I think that might be my working title for the Campaign/game. "Something with Gunz!" LOL. I ever so briefly looked through some Rifts stuff...shudder...sorry but I just don't have the patience for hour(s) long character generation anymore, not to mention the combat, the system ..ok stopping that rant now. Onward with the topic/purpose of this post. Hmmmm, I don't really see the need to make this a heavily skill based game, combat will be rough so no reason to have the players spend alot of time rolling up replacement characters...heh heh heh.. This could be done as one shots, go through the portal grab the stuff and bail! or a campaign or even a string of one shots tied together with the same background...."Everyone remember what happened to Skelter Squad not to mention the Crimson Cadre?!" The hardened mercs all gave a shudder at the memory of the TPK's err the massacres at the Rim of Hell. Hmmm...well no rush on deciding the mechanic just yet. I've got time to think about this one some more. And with my notorious Gamer ADD I'm sure I'll change my mind a few times before settling on something. Meanwhile after finding the issue of Warheads I went on to find a free online strip set in the same setting. It's called Loose Cannons. It's an all female team and you can read the issues here! I really like the character Sister Sphynx! I see her being some sort of Cleric worshipping the Egyptian Pantheon with some psionic abilities! Oh yeah! Once I finalize the system I'll get her stat'd up for sure. You know Carcosa has a great Psionics system that would be perfect for....hmmmm....well off to do some reading. Have a great evening and thanks for reading my ramblings. Like most folks I'm having to watch my budget closely these days, and as a result my gaming purchases have taken a serious hit of late. I still go to the "local" comic/game shop when I can (the only one left in town now), they recently put out several big boxes of old comics for 25 cents a piece! Woo Hoo! 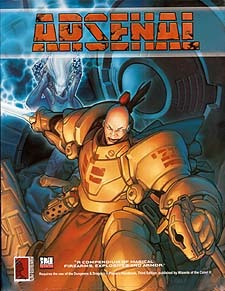 I found several cool looking comics, I'll be talking about more of them later, but one that gave me some surprising fodder for gaming was this one. 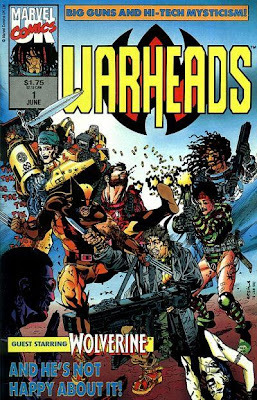 Warheads, its a Marvel UK short lived series from the '90s. The plot is perfect for an RPG Campaign. The Warheads are mercenaries working for a secretive group known as MYS-TECH. This powerful multinational (planar?) corporation has found the secret of accessing and somewhat controlling wormholes via techno-magic and sends these mercenaries through portals to other worlds/dimensions/times to steal alien tech and artifacts for the company to use for some serious profit, supposedly the mercs get a percentage of the cut, but the characters receive limited training and die off pretty regularly, 3 died in the first issue alone. Sounds pretty OSR doesn't it! "Oh Sh*t Run!" There's more to it but that in and of itself sounded pretty darn cool to me. 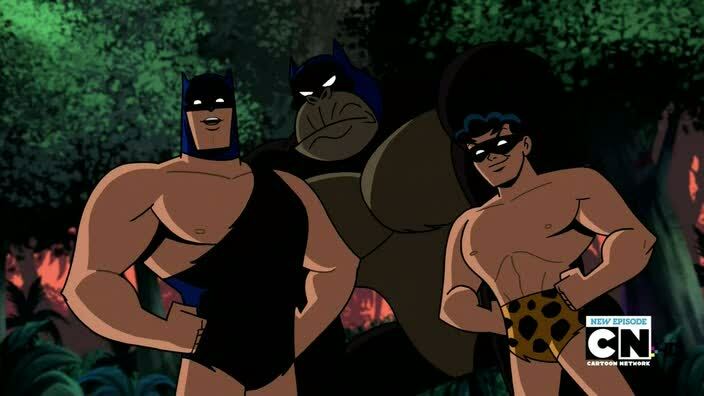 Seems like a great way to put together a mix of different characters, all low-level with a reason for being together and going out to get their butts kicked. Throw in some guns, alien tech, magic, monsters and you've got the makings of a fun campaign! Now to decide on the mechanic? I first thought maybe Stars Without Number which could work fine, and has a nice Psionics System, I considered Terminal Space (and that would definately be cool) but for some reason and folks may think I'm crazy for this, I'm thinking about using the X-plorers RPG! I mean the basic premise behind X-plorers is your a team of Troubleshooters sent out to "Fix" stuff. Heh heh heh. Anyways just thought I'd share my rambling thoughts. Needless to say I was quite please with my .25 cent purchase. Like many others I have disabled the awful new word verification system that Blogger for some insane reason has recently implemented. 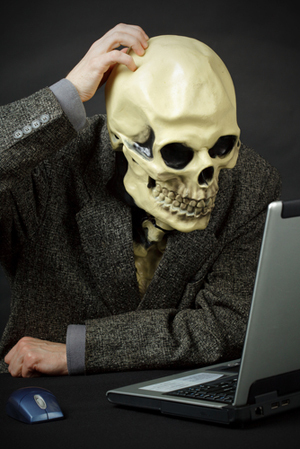 What are these boneheads doing?? And while I'm complaining about Blogger, does anyone know how to stop following blogs? Apparently the "Manage" option doesn't work, at least not for me, I get an error message that Blogger's "help" forum can't (won't) recognize, and now I'm getting spammed by a couple of "dead" blogs that I used to follow but now can't UNfollow. AARGH! Wisdom from the Wastelands Issue 3 Released! The third issue of Wisdom from the Wastelands is out. Here's the blurb for this issue," Like magical weapons in fantasy games, high-technology firearms are treasures that adventurers seek out with great eagerness in the post-apocalyptic world. 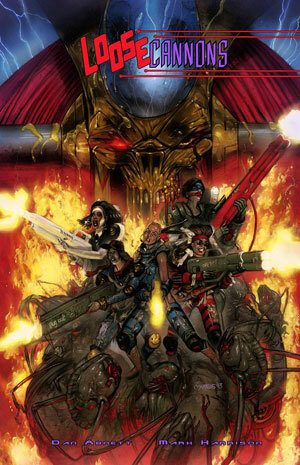 No matter how cool a weapon is, however, players will always be looking for something better to use against the many hazards that populate the science fantasy post-apocalyptic wastes, and this third issue of Wisdom from the Wastelands is devoted to new toys that Game Masters can use to reward — or punish — their players. Several of the new weapons presented in this issue have the option of different types of ammunition, adding even more variety to a game." Flamers, Railguns and oh yeah a Nerve Ripper Rifle! 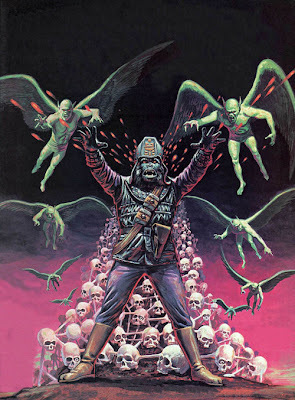 Get Some Mutant! : ) B.B. The second issue of Wisdom from the Wastelands is out, you can check it out here. 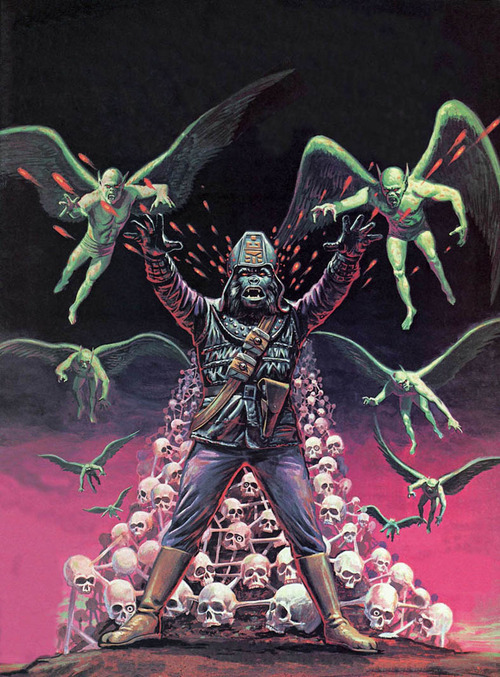 "Like a fine wine, some monsters improve with age, and it is to them that this second thematic issue of Wisdom from the Wastelands is devoted! An age chart can be a wonderful tool for Game Masters who want to scale monster encounters so that they are commensurate with the powers and artifacts possessed by the player characters. A chart of this sort is made up of three columns, one each for the age of a creature, its hit dice, and notes. Notes include damage, mutations, drawbacks, and anything else that affects the creature in or out of combat." I think the picture says it all! Have a Great Simian Saturday! I recently picked up the Zogorion Lord of the Hippogriffs zine/module! Gotta say this is a great product, can't believe it was only $2.00 which includes shipping! You can get it here. You can easily plug this into most Fantasy campaigns. I can see myself using it in conjunction with some of the great sandbox stuff Christian has put out recently. Not sure what is going on in this picture but it looks cool! "The inaugural issue of Wisdom from the Wastelands is now available! This new publication is dedicated to providing useful information, game content, and ideas to players of modern, science fiction, and post-apocalyptic table-top and role-playing games in general, and to fans of Goblinoid Games’ Mutant Future RPG in particular. 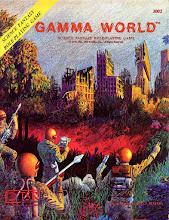 The rules it contains are compatible with this game and with any others that use the “Basic” system introduced in the most popular role-playing games of the early 1970s and are easily adaptable to many other games (especially successor systems and those covered by the Open Game License).